New KEF Q Series speakers aim to be better than ever | What Hi-Fi? The newest iteration of KEF's Q Series comprises two bookshelf speakers, three floorstanders and a centre speaker. KEF has unveiled a new generation of its storied Q Series speakers. The Uni-Q driver has been enhanced, with a new damped tweeter loading tube - intended to make for better treble. There's also a new, low-distortion inductor on the crossover, which is designed to give cleaner bass. 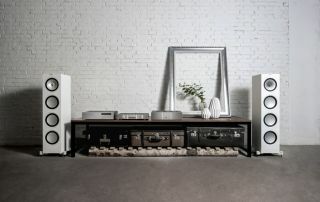 The range consists of two bookshelf units, three floorstanders and a centre speaker. The bookshelf speakers - Q150 and Q350 - feature a computational fluid dynamic port design. Basically, the port is on the rear of the speaker, reducing midrange leakage and hence improving clarity. The Uni-Q driver has also been moved to the middle of the cabinet, reducing internal resonances in a drive for improved levels of clarity and detail. The floorstanders are called Q550, Q750 and Q950. These have acoustic improvements of their own: for starters, their low-frequency drivers have a larger roll surround and new spiders, promising cleaner bass at high volumes. There's a new paper cone for improved mid-range clarity, while a new surround and rear extension are intended to deliver better bass. A new closed box mid-range cabinet reduces the load on the Uni-Q mid-range cone, which theoretically provides better clarity and detail, as well as punchier bass. A DC blocking capacitor has also been removed from the mid-bass driver - the intention is to improve mid-range clarity and make for more natural bass roll-off between drivers. The Q650c centre speaker benefits from the same closed box mid-range cabinet and crossover component as its floorstanding siblings. All the speakers are available to order now, with prices starting at £430 for a pair of the Q150s and reaching £1430 for a pair of Q950s.